A mansard roof is roughly a hybrid of a flat roof and a gambrel roof. Where there is a parapet wall surrounding the flat area, the roof is likely to exhibit many of the problems of a classic flat roof. If the flat and pitched structural members are not properly braced, the roof structure may become unstable, particularly in high winds. Where interior walls accept loads, these loads may introduce deflection, cracking, and even structural failure to the framing system. 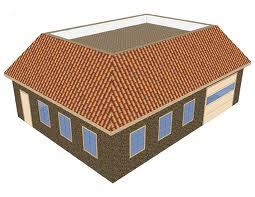 Therefore, a mansard roof may require a complex analysis, with the building structure modeled as a whole.